Work can be boring and predictable, even if creativity is part of your job description. In the interest of stress reduction and general happiness, I've collected a few of my favorite office-themed DIY projects to help you make over your office, stave off boredom, and generally improve morale. 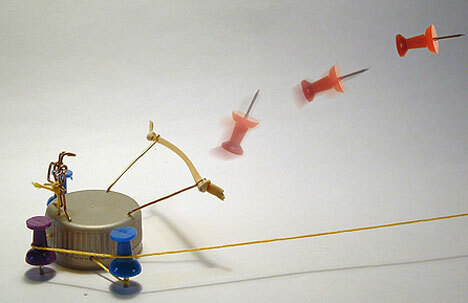 These are all culled from Instructables.com, and range from the practical to just plain fun. The first thing to do is personalize your office space. Unless you were lucky enough to swipe gear from a failed dot-com, you're probably stuck with boring standard-issue office furniture. Start by building some great divider panels for about $25/eayou can personalize them with a bit of paint, or leave them white for double use as projection screens. Can't afford Herman Miller? Build a custom chair from your favorite car seat, or give your cheap chair a make-over. Finally, you need a great laptop stand. 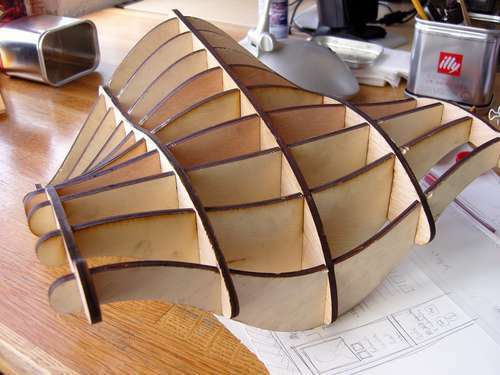 You can go for snazzy design in acrylic or laser-cut wood, or go ultra-cheap with solid cardboard construction or PVC. If you're really feeling the need to prove your geek street cred, replace the fluorescent tube lights above your desk with LEDs, or build yourself a fabulous mirrored tube desk lamp. Posted in Office • Permalink Tweet This! | Digg This! | Save to del.icio.us | Submit to Reddit | Stumble It! Laptops are everywhere in the workplaceprobably because they let you extend your workplace to, well...everywhere. But they can be a huge problem for you ergonomically, forcing you into bad postures and bad habits. So when doing extended work on your laptop, follow these guidelines to keep your body as sound as your mind. We all know that office spaces benefit tremendously from plant lifethey bring warmth to an environment while absorbing toxins from nasty corporate airbut the trick is keeping them alive. Office spaces can be very unfriendly to plants, often characterized by low-light conditions, stagnant air, and, for many of us, hectic schedules interrupted by business trips and vacations. Luckily, the wide breadth of houseplant varieties offers options for all situations, from windowless spaces to constant traveling. And this doesn't mean that you'll be stuck choosing between a Spider Plant, a Pothos and a Ficus tree. Though resilient and often magnificent, we're here to tell you that there are many less conventional options, which, as creative types, we know you'll appreciate. It's important to remember that the aesthetic and air purifying qualities of a plant depend first on its health. This doesn't mean that you need to pay meticulous attention to a watering and fertilizing routinein fact, unlike more finicky houseplants, hardier office plants don't see much sun or expect much water, suffering most often from overwatering and root-rot. So be sure to research the specifics of any plant you're thinking of buying. Though they may not require a lot of maintenance, even the hardiest of office plants need the right combination of conditions to thrive. 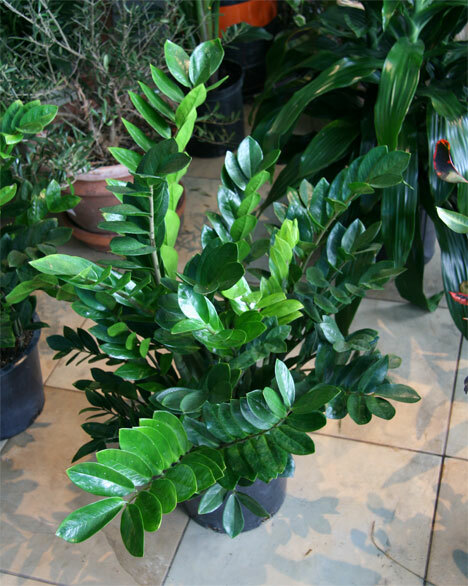 The ZZ Plant, or Zamioculcas Zamiifolia, is a striking but amazingly robust plant that will do well in most offices, with a minimum of care. It can be placed in a wide range of light, doing best in filtered sunlight but tolerating anything from very low light levels to bright, indirect sun. Because it has a large potato-like root that stores moisture, it requires only infrequent watering. On top of all that, it will never attract pests. Like the Pothos or the Spider Plant, the ZZ's are easy to share with friends; propagate it simply by sticking a leaf into moist soil. Because the ZZ is a slow-growing aroid, keep in mind that it may take up to a year for the leaf to develop a substantial tuber. Office Snack Gourmet are recipes designed to turn even the most disgusting of office snacks into delicious gourmet meals. Since a lot of these ingredients are laying around a typical office (or vending machine), there's no better time to get creative, save money, and still treat yourself to something special! I suggest investing in a really great porcelain plate and some stellar silver to complete the experience. 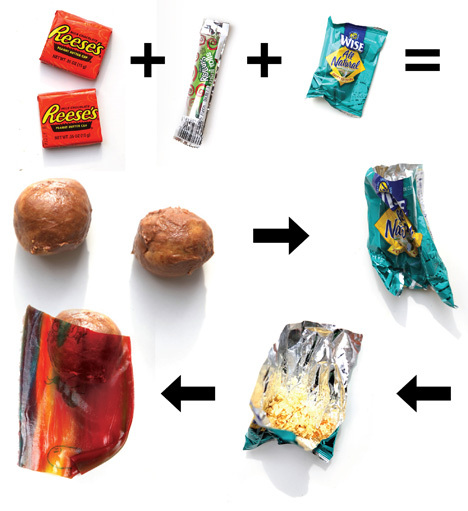 Remove Reese's Peanut Butter Cups from packaging and knead into balls. Crush potato chips into fine powder. Unroll Fruit Roll Up and cut in half. Place one Reese's ball in center of one half Fruit Roll Up. Sprinkle small amount of potato chip powder on top of Reese's ball. 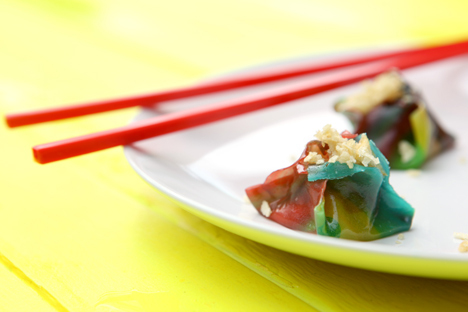 Fold up corners of Fruit Roll Up to meet in center and form dumpling shape. Repeat as necessary. Enjoy. For designers at least, it may indeed be true that a clean desk belies not a lot of work getting done. But for most of us, it's the opposite problem: We are buried in our sketches, mock-ups, and source materials. 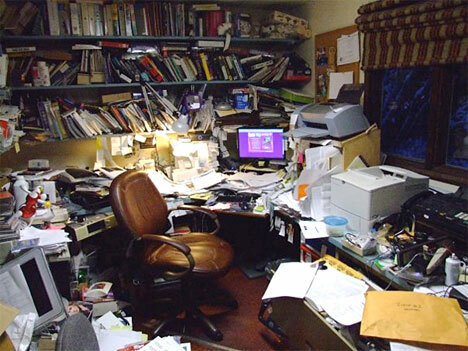 Fear not, for no matter how messy you think your desk is, there is surely someone out there with worse. Need proof? Check out the winners of the Messy Office Contest. See? Yours isn't so bad. People in the creative industries get to work on some juicy problems, but it's no secret that design worklike all workinvolves a ton of, well, menial work, mostly in front of a computer. Having the right listening material can help you through some of those long stretches, so when you're full-up on music, consider some of the following podcasts instead. New Yorker Fiction Podcast: Every month, The New Yorker invites authors whose stories have appeared in the magazine to read a short story of their choice and discuss it with Deborah Treisman, the New Yorker's Fiction Editor. The Best Show on WFMU: Tom Scharpling (also the executive producer of the TV series Monk) hosts a three-hour-long, weekly call in and comedy show on the freeform radio station WFMU. Both real and fake characters call in on a range of topics, from Jugalos to "Call in if you're famous." The podcast doesn't include the music (due to licensing restrictions), so fast forward through the fill-in theme if you're feeling impatient. The Economist: A few times a week, The Economist turns an important story from their magazine into a podcast. Perfect for those of you who wish you could read the print version but can never find the time. Studio 360: A great way to stay in touch with pop culture and the artsisn't that part of your job description anyway? Theory of Everything: This show aired from 2004 to 2007, promoting what host Benjamen Walker calls 'investigative fiction,' blurring the line between literature, interview, performance and the news. We're not sure why it went off the air, but the old shows can be found right here. The Sound of Young America: "A public radio show for all things that are awesome," this show is like Fresh Air, but a little bit cooler. The host, Jesse Thorn, deftly interviews guests that include screenwriter Rob Siegel and comedians Michael Showalter and Michael Ian Black. The Moth Podcast: the best of The Moth's live storytelling performances. The Monocle Weekly: The international global affairs, design and culture magazine Monocle posts a weekly collection of interviews, discussions and field reports. Check the rest of the site for more programming, including a summer series and a tour of Taiwan. Fluxcast:We know this falls into the music category, but if you can't resist, at least try to listen to something new. 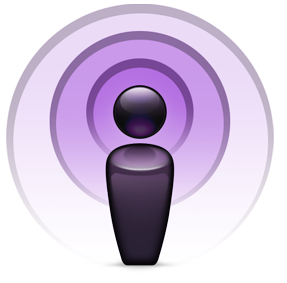 Fluxblog, one of the oldest and best mp3 blogs, mixes old and new music in their hour-long, weekly podcast. Like most designers, we have our preferences when it comes to our tools. We tend to favor the tried-and-true, but sometimes you've gotta go for something a bit more exceptional. So let's start with that one first. Felissimo's gigantic color pencil set for Social Designer is our favorite new monthly subscription. 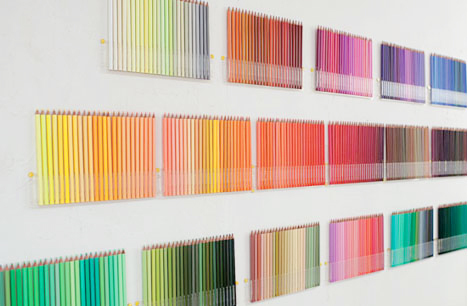 That's rightaside from boasting a spectrum of 500 colors, the set is available by the month: 25 pencils for 20 months. Felissimo goes the extra mile to make this service even more appealing, offering unique display hardware highlighting the color gradient, from a wall-mounted vitrine to a snap-together, tabletop color wave. It's hard to beat a regular rubber band in terms of functionality and versatility, but the Anchor Band comes pretty close. It has a small hook, or anchor, on one end, extending its application as a bundling devices to things like computer cords, plant stems, and earbud wires. Surprisingly difficult to find, these rubber bands can be purchased from All Stake Supply in Australia, where they are marketed as a gardening product. But almost nowhere else. Runner up? The equally evasive and compelling reinterpretation of an X-band allegedly spotted in New York at Muji, though we've see no sign of it in the catalog. Because of unexpected snags, creative over-zealousness, or an order that was almost too tall to fill, your project is down to the wire. Your team's been working around the clock to finish up, but the deliverables need to get to the client tomorrow morning. Finding the right package carrier and location for a last minute shipping job is a design problem in itself, so here are a few tips that will help you get your project out the door. Now. The key to last-minute shipping is being prepared in advance. Open accounts with all the major carriers, and order their free shipping materials and pre-printed airbills to keep around the office. When the time comes, you'll be able to burn that CD and finesse the cover letter instead of finding the right envelope or filling out airbills. Don't like to write? You can do most of the paperwork online. In a perfect world, each company's online location finders would point you to your last possible drop-off points. Because it doesn't always work that way, making some calculated guesses about each shipper's logistics will help search engines produce better results. For example, UPS drop boxes are checked after their stores close, so when you search for locations online, uncheck all UPS locations by the drop boxes. This yields much more legible and useful resultsusually a box at an airport or an odd suburban building lobby. You can filter by a range of drop-off times by futzing with the advanced options, but this method is faster, producing just the right range of results when you're in a hurry or using a smartphone. FedEx boasts the latest collection times of all, but these vary with a location's logistical proximity to their hub in Memphis. For example, the latest drop-off in Los Angeles is an early 7pm, so UPS might be a better bet. 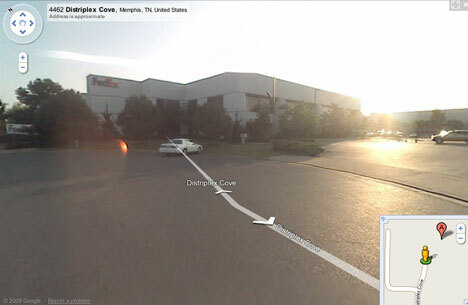 In Memphis, however, you can drive your package right up to the hub as late as 11:59 pm, just before the sort starts. Lovin' the augmented reality? Give this one a try.